Topics: What We Buy, Gold, Silver And Platinum Jewelry, Fine Watches And Pocket Watches, Sterling Silverware And Tea Sets, and Anything Gold. 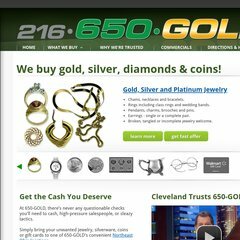 650gold.com 650 Gold: Garfield Heights, Mentor, Parma, Shaker Heights, Avon ..
650gold.com 650 Gold: Silver Tea Sets, Flatware and Sterling Silverware Buyers ..
650gold.com 650 Gold: Platinum, Silver and Gold Jewelry Buyers and Estate ..
650gold.com 650 Gold: Silver Coin Buyers in Cleveland Ohio – Gold, Silver ..
Its 2 nameservers are ns125.pair.com, and ns7.ns0.com. It is hosted by Pair Networks (Pennsylvania, Pittsburgh,) using Apache/2 web server. Its IP Number is 216.92.47.8. PING (216.92.47.8) 56(84) bytes of data.